We always love it when Rattletree plays Empire. We’re big fans! 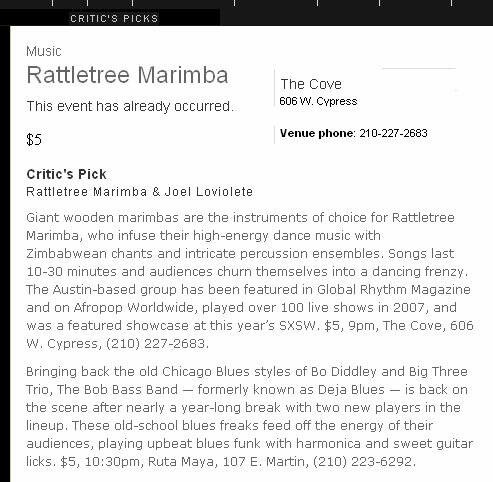 Rattletree is one of ATX’s most UNIQUE sounds, blending electronic music with traditional music of Zimbabwe! Get ready to DANCE. …keeping the Shona music movement alive and growing in the Southwest! 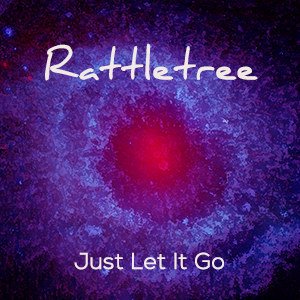 Rattletree is a “must see”. They are a high energy fusion of African and other world influences that is immediately accessible, and rousing. I AM totally amazed at the size of their Marimbas!! WOW -it’s almost Surreal ~ you’ve really got to see this!!! The sounds are Amazing & So Much fun to dance with! It was a sight to see and a unique joy to hear! 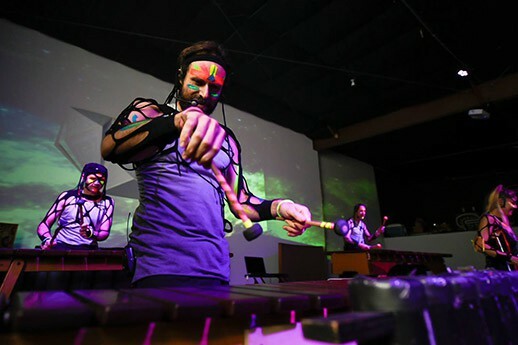 Marimba and electronica may not be musical terms associated with one another, but Rattletree Marimba, based in Austin, has earned a reputation for fusing giant, hand-made mallet percussion instruments with hypnotic grooves that make you want to get up and dance. Member of the Texas Commission on the Arts (TCA) Touring Roster. Featured on WWOZ, New Orleans. Letter of recommendation from the principal of Park Crest Middle School. Rattletree was the perfect pick to kick-off our civic engagement project on campus. The musicians were engaging and extremely talented. The band’s music appealed across generational and cultural divides, and they even got a bunch of timid college students out of their seats and on the dance floor. -Kelli Arena, Executive Director of the Global Center for Journalism and Democracy. 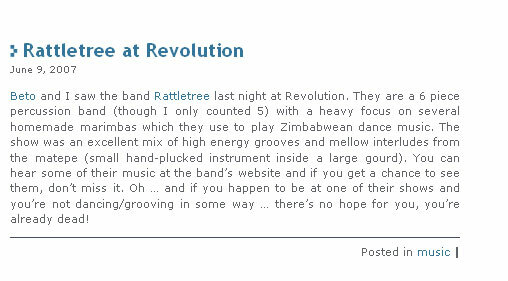 Rattletree is authentic Zimbabwean marimba with a twist. It’s impossible to resist the African beat commanding you to move along with the energetic music. The more I listened to Chamukwenjere the wider my frequencies became, which means that I could go to higher planes of existence. The song is a vehicle to higher astral realm. It is simply beyond words. Our members are still talking about how much they enjoyed the fun, high-energy music. …if you happen to be at one of their shows and you’re not dancing/grooving in some way, there’s no hope for you, you’re already dead! 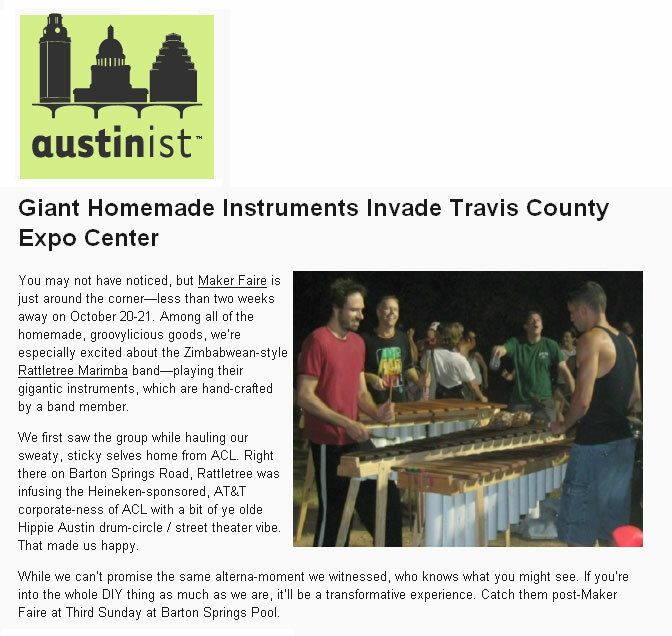 Rattletree’s marimba demonstrations provided the perfect musical backdrop to our International Marketplace! Their inviting attitude about the marimbas helped students provide their own soundtrack to the event. I was extremely impressed with the craftsmanship of the marimbas! The show was mesmerizing. The music was so beautiful and hypnotic, most people couldn’t stop dancing and they were fabulous to watch. Looking forward to another show!! 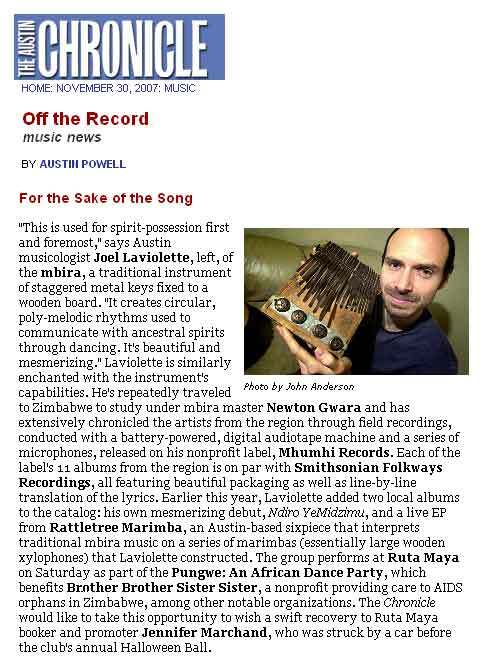 I’ve heard all the best players of Zimbabwean music for over 20 years, and Joel Laviolette is a serious chain in the link of it’s continuity. Fabulous sounds. Fascinating seeing these lily white guys sing and play African music with as much passion and talent as if they were from the continent.